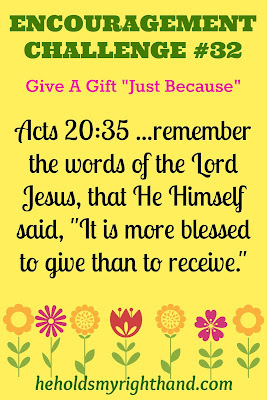 He Holds My Right Hand: Encouragement Challenge #32: Give A Gift "Just Because"
Encouragement Challenge #32: Give A Gift "Just Because"
If this is your love language, gifts to you are visual representations of love and are treasured greatly. But, I think everyone enjoys receiving a gift, and knowing they are being thought of, even if that is not their main "love language." Its not really about the kind of gifts that are given. Its about the thoughtfulness and effort put into them. This week, give someone a gift to let them know you are thinking of them - "just because." If you know what kind of candy or cookies they like, go buy a package (or make them) and give it to them - "just because." If you know they like flowers, go pick a bouquet - "just because." If you know what they collect, give them something to add to their collection - "just because." If you know what kinds of books or movies interest them, pick one up - "just because." If you don't know much about their likes and interests, you can still cheer someone up by making a BOX OF SUNSHINE. (Note: I found this link on Pinterest awhile back. It gives suggestions on what to put into a box of sunshine, and includes printables you can download.) You can do the same thing with an orange theme and make a card that says, "Orange you glad we are friends?" or "Orange you sweet!" Whatever you give, you really can't go wrong. 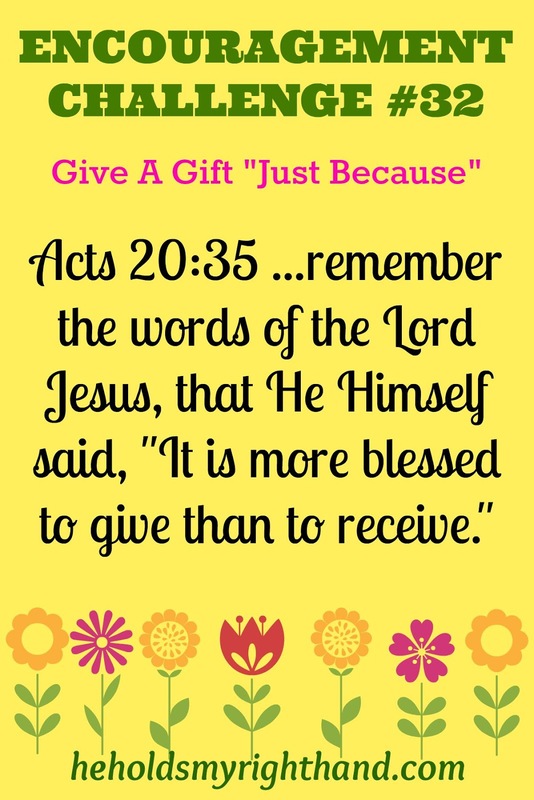 Everyone likes to know they are being thought of, and will be encouraged that you took the time to choose a special gift just for them - "just because." I recall receiving a box of sunshine once. It brightened my day!